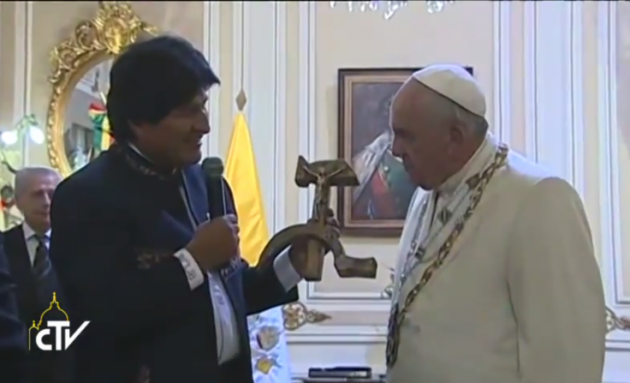 (Photo: Screen grab from Bolivia President Evo Morales presents the gift to Pope Francis)Bolivia President Evo Morales seeks to present Pope Francis with a crucifix mounted on a hammer and sickle on July 9, 2015. Pope Francis is a champion of the poor, but he was not impressed when his Bolivian host President Evo Morales sought to give him a gift of a crucifix mounted on a hammer and sickle. The Pope rebuked Morales after the left-wing South American leader presented him with the crucifix mounted on the international symbol of the avowedly atheist creed of communism July 9, The Telegraph reported. Morales is an anti-clerical champion of indigenous rights, has taken decisive steps to empower Bolivia's 36 native groups and embed their rights in the country's constitution, International Business Times reported. The Bolivian president has also acted to change the constitution in 2009, making the Catholic nation a secular country and removed the Bible and cross from the presidential palace when he took office in 2006. "That's not right," the Pope noted, The Telegraph said. It said the slight was more notable as the Argentine leader of the Catholic Church had praised the social and economic reforms of Morales when he arrived from Ecuador on the second stage of a three-country tour of South America. In Santa Cruz at a Mass for hundreds of thousands of people in Bolivia, said on July 9 that everyone had a moral duty to help the poor, and that those with means could not wish they would just "go away," Reuters reported. "If one can apply the term to a 78-year-old prelate who has turned lack of ostentation into an art form, then Pope Francis is a rock star," The Economist comments in its latest edition. It said the eight-day tour of the papacy and the first to Spanish-speaking America - may do more than underline the popularity in his home region of Jorge Mario Bergoglio. "It may add political definition to his papacy." Francis' words have stirred supporters of liberation theology, a set of leftist ideas that were influential in Latin America in the 1970s and 1980s, wrote The Economist. Francis accelerated beatification of Óscar Romero, a Salvadorean archbishop who was gunned down by a right-wing death squad while celebrating mass in 1980 and is a hero to the left. "Yet Father Bergoglio always rejected Marxism and violent revolution, which some leftist priests supported. "Rather than embracing liberation theology, he is reinterpreting it for a post-Marxist age. Romero's 'option for the poor wasn't ideological but evangelical,' says the Vatican. "The Pope's criticisms of free-market capitalism chime both with traditional Catholic social doctrine and with Peronism, Argentina's populist-nationalist political movement, to which he was once close," wrote the weekly newspaper. It continued that the biggest test of the Pope's political skill will be whether he can help to bring about a peaceful and democratic transition in Venezuela. There, "the unpopular government of Nicolás Maduro faces likely defeat in a parliamentary election this year - if it is free and fair." Francis leaves July 10 for Paraguay, the last stop on his "homecoming" trip.